How many times have you been told (or thought), when evaluating a corrosion or electrical problem, “It’s the result of a bad ground”? But what exactly does that mean, and can it really be the cause of so many of these issues? In my experience, while it often is the source of a problem, this is a fall-back phrase, used when folks really aren’t sure what the problem is or how to evaluate it. Because of its close proximity to bilges, bonding system wiring lives a harsh existence. Terminals should be tin-plated and connections made using conductant paste. Coat with corrosion inhibitor when complete. Having said that, the misunderstanding is not surprising: Bonding systems are covered by two ABYC standards, E-2 Cathodic Protection and E-11 AC and DC Electrical Systems, which have different goals, corrosion mitigation and electrocution/fire prevention, respectively. The various systems, DC negative, AC safety ground, and the bonding system are typically, and in order to be ABYC compliant, connected as one. While the terms are used interchangeably, there are differences between grounding and bonding systems and their requirements and goals. Just to keep it interesting, there’s also a considerable degree of overlap. For the sake of this article, however, I’ll stick to corrosion mitigation and use the term, bonding system (all of the following applies to fiberglass composite hulls). Design: What Does a Bonding System Do? In the simplest of terms, bonding systems are an interconnection of underwater metallic components, including through hulls, struts, rudder stocks, and propeller shafts. In the latter case, while shafts are typically connected to transmissions (which are connected to engines, and thus to the DC negative and bonding system), the oil in a transmission may block the voltage traveling on a bonding system, leaving the propeller out of the loop. While not mandatory, it is for this reason that many propellers and shafts rely on shaft brushes to ensure a better connection to the bonding system. It’s worth noting, shaft anodes also solve this problem with less hassle, provided the configuration allows for them. Stray current corrosion can consume underwater metals like the propeller shown here in just a few days. While not absolute, bonding systems do provide some measure of protection. That’s the how, but why bond? Interconnection of these underwater metals protects against stray-current and galvanic corrosion. 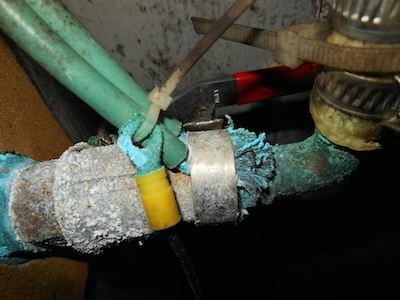 Stray-current corrosion occurs when direct current, i.e., from a battery, “leaks” into water, typically bilge water (often from faulty bilge pumps or their wiring). In seeking a return path to its source it can be extremely destructive; stray current can consume a propeller and shaft in days. Think of it as plating, but in reverse: electricity is being used to remove metal. A bonding system provides an alternative path back to the power source that doesn’t travel through the water, thereby reducing, although not necessarily eliminating, the destructiveness of this type of corrosion. Bonding systems also mitigate galvanic or dissimilar metal corrosion, which occurs when dissimilar metals are in contact with each other, either directly or via wires, and immersed in an electrolyte (seawater in these cases), establishing a galvanic cell or battery. Once again, it’s similar to plating in reverse, albeit at a glacial pace. If stray current corrosion is the hare, galvanic corrosion is the tortoise, taking months and years to do its dirty work. 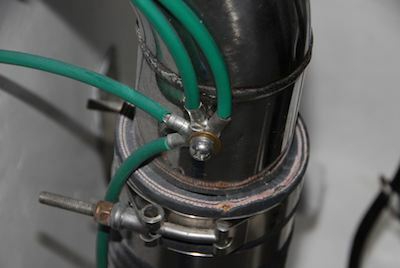 Confusion about bonding systems can be seen in the practice of connecting disparate plumbing components within a vessel, which is common among builders and refitters. In the vast majority of cases such bonding offers little protection, as these components reside in a different “body of water” than the anodes to which they are ultimately connected. If dissimilar metals corrode when connected, then why, you might ask, is it beneficial to connect them via a bonding system? There is one more important piece to the bonding system puzzle, the well-known but often misunderstood anode. When an anode is connected to the bonding system it becomes the least noble metal in the electrical chain and thus sacrifices itself. 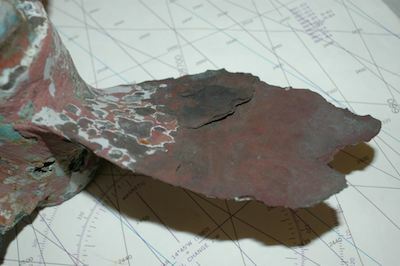 This is why anodes, which could be zinc, aluminum, or magnesium, depending on whether the hull is in salt, brackish or fresh water, often include the prefix “sacrificial,” as they sacrifice themselves to protect the other interconnected metals, known as “cathodes.” It’s an approach often referred to as, “bond and protect.” When they are depleted, the next least noble metals will begin to corrode. Having said this, metal corrosion can still occur even if there is some anode left, a frequent occurrence with sterndrives for instance. When the anode is depleted to the point where it’s unable to maintain the aluminum at a voltage more negative than its freely corroding potential, the aluminum will begin to corrode in spite of the presence of an anode. Generally, anodes should be replaced when 50% or more depleted. While this interconnection method works well, it has limitations. One of the most misunderstood of these is the distance over which an anode can provide protection. Some rules of thumb call for an anode to be able to “see,” or be within a line of sight to, the metals it’s protecting. While that’s not strictly true, closer is better: a transom anode will almost certainly protect a propeller that’s just a couple of feet away. Perhaps the most misunderstood case involves anodes found within the cooling systems of engines, generators, and other heat exchangers. These anodes are sized and designed to protect only these components. They cannot protect underwater metals and, more importantly, hull anodes cannot protect gear filled with raw water within the vessel. Protected metals must reside in the same “body of water” as the anode. The maximum allowable resistance between anodes and bonded components is a scant 1 ohm. Hose clamps and unterminated conductors are a poor means of making such connections. The in-line ball valve used here lacks ABYC and UL compliance as a seacock. It should, therefore, come as no surprise that it does not include a dedicated bonding fastener. A few requirements must be met for a bonding system to work. 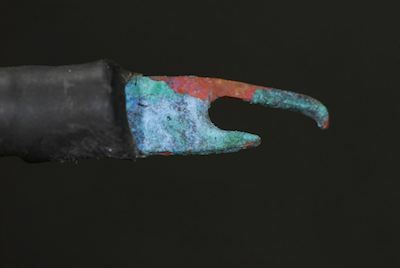 The interconnection of the metals must be reliable and of low resistance; no more than 1 ohm can exist between the anode and any protected metal, when measured with the vessel hauled out. This often represents a tall order as bonding systems live a harsh life, near and often in bilge water. Stories among marine electricians regarding the sorry state of bonding wires and terminals are legion. Therefore, the utmost care must be taken to ensure these systems remain in good working order. Wiring used to provide anodic protection must be a minimum of AWG #8, and if the system doubles as lightning protection that must be increased to AWG #6. Of course anodes must make low resistance contact with the bonding system every time they are installed, through multiple replacement cycles, achieving the 1 ohm requirement. Like any other critical component, bonding systems should be inspected regularly. When installing or augmenting bonding systems, connections should be made using heat shrink terminals, and conductant paste such as Thomas & Betts Kopr-Shield. Completed connections should be coated with corrosion inhibitor such as CRC Heavy Duty Corrosion Inhibitor. Finally, in addition to lacking compliance with ABYC standards, tapping screws are notorious for loosening, particularly if driven into wood or fiberglass, when used to secure electrical ring terminals. Therefore, only machine screws should be used to complete bonding and other onboard electrical connections.